Field Day (FD) is coming very soon. This year, Field Day is June 22-23. If you’re not familiar with what field day is, please see the attached flier from the ARRL. Our operating location is at Bedwell Bayfront Park, Menlo Park, at the bay end of Marsh Road. Signs will guide you to the operating site once you’re in the park. FD operating begins Saturday, June 22 at 11 AM and continues until Sunday, June 23, 10:59:59 AM. PAARA puts on a big effort for FD. Were are arguably the biggest effort in the bay area. It takes a fair number of people to pull this off. This year, we will again be operating 4A. This means there will be four HF stations operating at one time using emergency power. We will also have a Get On The Air (GOTA) HF station for those who have never worked HF before. There are plans to have a VHF/UHF/Satellite Station too. Time To Buy A PAARA Field Day T-Shirt !! With Field Day arriving soon, it's time to order your Field Day T-Shirts. 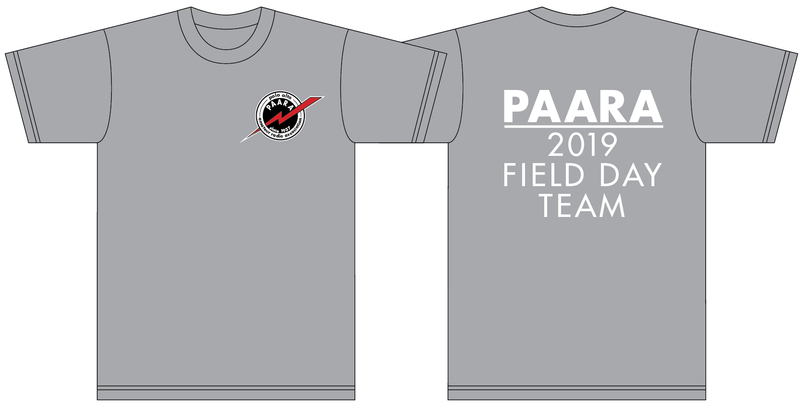 They are great looking shirts with the club logo on the front and 2019 PAARA Field Day Team on the back. Sizes available are MED, LRG, XL, 2XL, and 3XL. Prices: $22.00 for Standard length or $23.00 for Tall. Note: The last day to place your order is Friday, May 17th, 2019. Once orders are closed, the tee shirts will no longer be available. Payment may be made via Credit Card or PayPal transfer (preferred). You can also order them directly from Marty, W6NEV using check or cash. Contact info is below. Cash and check payments are due when order is placed. Make checks payable to PAARA. Remember shirts are available by pre-order only. Shirts can be picked up at the June meetings or from Marty at his home (address above). Shirts not picked up before Field Day will be available at the site on FD weekend. Please include your name, call, size, and quantity for each size. REMEMBER, LAST DAY TO ORDER IS MAY 17TH. Note: You can order multiple shirts in one order. After you select your Shirts size, click the ADD TO CART button and you will be taken to your shopping cart page. If you then click CONTINUE SHOPPING, you will come back to this page where you can order more shirts before checking out. Field day is an emergency communication exercise. Each year, during the last full weekend in June, amateur radio operators presume there has been a major disruption to electric power and commercial communication systems. The power is off, there is no local phone service, no long distance, no cell phone, no internet service, even some of the government radio systems have been knocked out. In response, amateurs assemble two-way radio stations operating on emergency power to transmit messages over the amateur bands. In a real emergency, radio amateurs would send messages, telegram style, for public officials over these stations. For example, the mayor might write a message to send to the governor, hand it to the radio amateurs who would then relay the message, station by station, to the state capital and deliver it. Similarly, the reply from the governor would be relayed back to the mayor. That’s the idea behind field day, practice setting up a radio station on short notice and operate it on emergency power. Many amateur clubs such as PAARA take part. Interested in participating? Well, there are three major activities to work on: moving and setup of the equipment on Friday, operating Saturday and Sunday, and then disassembly on Sunday. Everybody is welcome to join in. First comes assembling the PAARA station on Friday. The electric generators, radios, towers, antennas, and shelters must be brought to the field day site and put together into working radio stations. This gives you a great hands-on opportunity to work with a variety of equipment. You’ll be piecing towers together, mounting antennas and rotators on them, threading transmission lines on them, and then hoisting them skyward. Down on the ground, there are power supplies and two-way radios to hook up. The generator has to be cabled to the radio equipment. You’ll see equipment you’ll never find in a radio store, and you actually get to use it, not just look at it. Next comes operating the stations, starting on Saturday. There probably won’t be an actual disruption to commercial communication systems during field day, so instead of relaying telegrams for public officials, amateurs cont act one another to determine the range of each station. Operators generally work in pairs at each radio. One person operates, the other logs contacts. The operator calls “CQ field day, CQ field day”, and gives the station’s call sign, W6OTX. When a distant operator responds to the call, the logger records the call sign and location of the far station. It is very similar to typical ham radio contesting, and clubs compete to see who gets the most points by contacting the most stations. This goes on for 24 hours straight, but obviously operators work in shifts of a few hours at a time. During field day there are stations in the U.S., Canada, and many other countries participating on most of the amateur bands, including HF, VHF, UHF, and satellite. Most of the operating modes are used as well, such as CW, voice, packet, FAX, and even TV. Field day is a great opportunity to try a mode that you might not have at your own station. PAARA typically has a CW and a SSB station on HF plus a station on VHF. Other bands and modes might also be used depending upon what the club members choose to do during field day. Since a logger can serve as the control operator, you can be the radio operator and use modes that your own license class does not permit. For example, during field day, Technician class licensees can use voice or CW on the HF bands. After the official field day operating period ends on Sunday, all that equipment has to come back down and go into storage for the next field day, or maybe a true communication emergency. There is still work to do after field day weekend has past. The contact lists must be submitted to the ARRL for compilation. In addition, the field day planners get together to analyze the contact data to see where each station could reach, where it didn’t reach, and to revise the plan for the next field day in order to maximize the radio coverage area. Field day is a lot of fun, a great way to work with a team of amateur radio operators, and try out the biggest variety of equipment you’ll probably ever see in one location.